It’s like Discogs, for Record Shops & Record Events. Vinyl Hub was launched last year with the sole purpose of documenting every physical record store and record event on the planet. The database aims to provide an accurate listing of all places records are bought and sold (VinylHub also catalogues record fairs and pop-up shops), useful to vinyl enthusiasts and crate diggers everywhere. 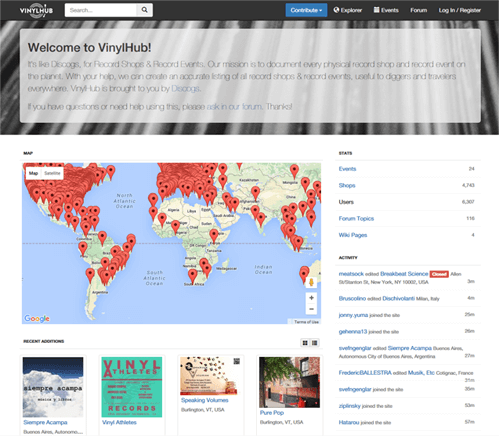 With more than 6000 users contributing information about the stores in their community, VinylHub has gathered details of more than 4000 shops worldwide.